Skier visits have increased 11% per year over the past 13 years. 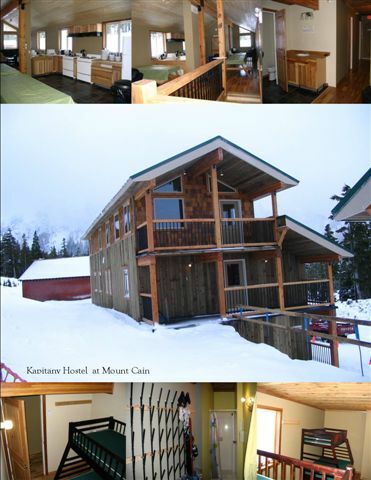 The Mount Cain is a community owned ski hill, nestled in the remote backcountry of northern Vancouver Island. It offers a unique experience to skiers, snowboarders, and backcountry skiers and is particularly popular with the younger demographic. Visitors wanting to enjoy the outdoor recreation opportunities the mountain provides were deterred by the lack of convenient overnight accommodations. To support the Regional District of Mount Waddington’s long term plans to develop Mount Cain into an all-season destination, a hostel lodge needed to be built. Additionally, the T-bar system required upgrading as a number of T-bars were very old and expensive to maintain. The Kapitany Lodge was built right beside the ski run and offers a warm and inviting environment for visitors. The rooms above the lodge facilities provide hostel style accommodations, allowing guests to ski-in and ski-out as they enjoy the mountain. The old T-bars were replaced, reducing maintenance costs and providing safe, reliable access to the ski hill. With the project completed in 2012, outdoor recreation enthusiasts can now enjoy the abundant natural beauty of Mount Cain year round. Mount Cain has deep powder, 21 runs, with 1499 vertical feet of terrain for visitors to enjoy. Schools and youth organizations can now schedule group trips for skiing and alpine hiking. The new amenities created have significantly increased the number of visitors to the mountain and have created additional seasonal employment. The additional revenues generated by the Kapitany Lodge are reinvested in the long-term sustainability of Mount Cain, to ensure continued winter tourism attraction for the region.